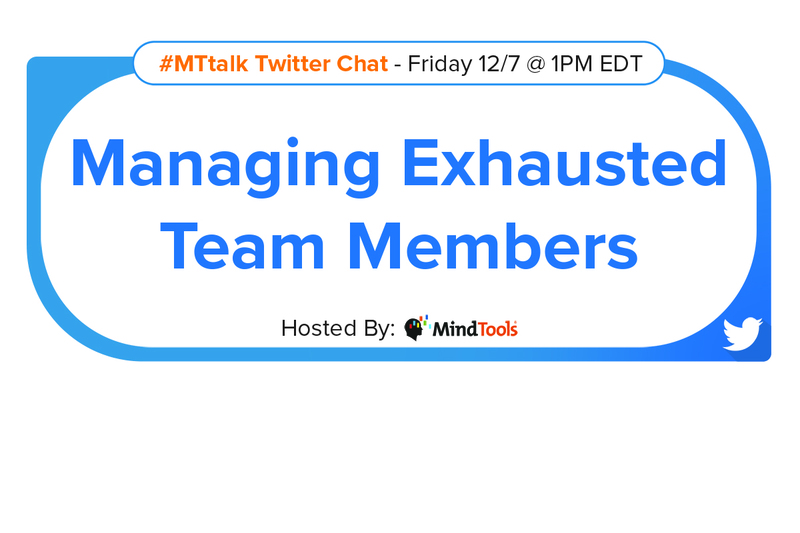 Managing Exhausted Team Members – Join Our #MTtalk! The scene that greeted Tina when she walked into the bathroom frightened her. Leslie, her most trusted manager, was bent over a hand basin, sobbing. Tina rushed to her friend and asked, “Leslie! What’s wrong? Did someone get hurt? Are your family OK?” It took Leslie a few moments to answer. “No, everyone is fine,” she managed to reply. The pieces started falling into place in Tina’s mind. The company was still growing and she’d given Leslie a lot of responsibility. Tina co-owned the company with her husband, and they spent a lot of time out of town. She realized that they relied heavily on Leslie to keep things running smoothly in their absence, even though Leslie already had her own department to lead. It was in Leslie’s nature to take her responsibilities very seriously. She never refused an appeal for help, and regularly worked from six in the morning until well past seven at night. And, more recently, Leslie had agreed to take on another department, too, after that manager had resigned. She was actually beyond exhausted – she was burnt out. Leslie’s story isn’t one that I made up. I know both Leslie and Tina very well, and saw for myself how exhaustion could make a person shrink to a shadow of who they really are. In our Twitter poll this week, we wanted to know what you think is the most likely cause of exhaustion at work. Surprisingly, less than 15 percent of respondents voted for “individual workload.” In fact, more than 40 percent of people felt that being connected 24/7 is the biggest culprit! Click here to see all the options and results. • How can you identify exhausted team members? • What are some of the biggest risks for the company if team members are exhausted? • What are possible causes for team members feeling exhausted? • How can you help prevent team members from being constantly exhausted? • How does your behavior change when you’re feeling exhausted? • What effect does exhaustion have on performance? • What short-term coping strategies do people tend to use when they’re exhausted, and how helpful are those strategies? • What measures can you take today to prevent exhaustion within your team? To help you to prepare for the chat, we’ve compiled a list of resources for you to browse.